I am quite upset to see incorrect and confusing numbers reported in the media as to how many and how close wind turbines are to be from the schools in Lambton County. It is not the media’s fault. Nextera, Suncor: I have reviewed wind project noise documents for 4 years – I should be competent in it by now. But I find I am tearing my hair out reviewing the documents, trying to find the exact noise, and distances turbines are to the schools in your projects. The Bosanquet elementary school does not even have a Receptor ID on the project draft map. The hundreds of receptor ID’s are not numerically ordered in the noise chart – and I honestly can’t even find the school ID (or in this case, it’s neighbour’s, because it doesn’t have an ID). Ontario Ministry of Environment Officer Martin McConnochie November 29, 2012 at the home of a person affected by wind turbines. He explains why he could not measure the noise of the wind turbines on a particularly windy/noisy night. More evidence of corruption in this wind energy scandal. Ontario’s opposition Tories have intensified demands for a halt to wind farms after the release of government documents showing bureaucrats repeatedly raised concerns about noise from turbines. “I think the taxpayers of Ontario deserve to know the truth,” Lisa Thompson, MPP for Huron-Bruce and PC deputy critic for green energy, said Wednesday. The documents were obtained through a Freedom of Information request by an Orangeville resident who asked for all letters, memos, records and e-mails between the Guelph district Environment Ministry office and other ministry staff regarding a proposed order against the Amaranth and Melancthon wind turbines. The request covered a period from March 2009 to September 2010. Of 300 pages of records, the government released only 26 pages with sections removed. But the 26 pages that were released showed the Guelph Environment Ministry office was being hit with a large number of noise complaints dating back to 2006 for the 133 wind turbines, the largest turbine installation in the province at the time. GRAND BEND – Until a few months ago, Lisa Michaud didn’t know who ‘MOE’ was. 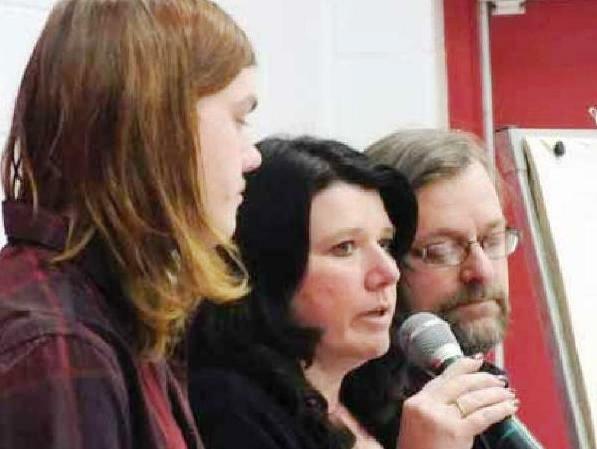 The Thamesville woman and her family have gotten to know MOE – also known as the Ministry of the Environment – as they deal with the government agency because of the impacts of living beside industrial wind turbines. 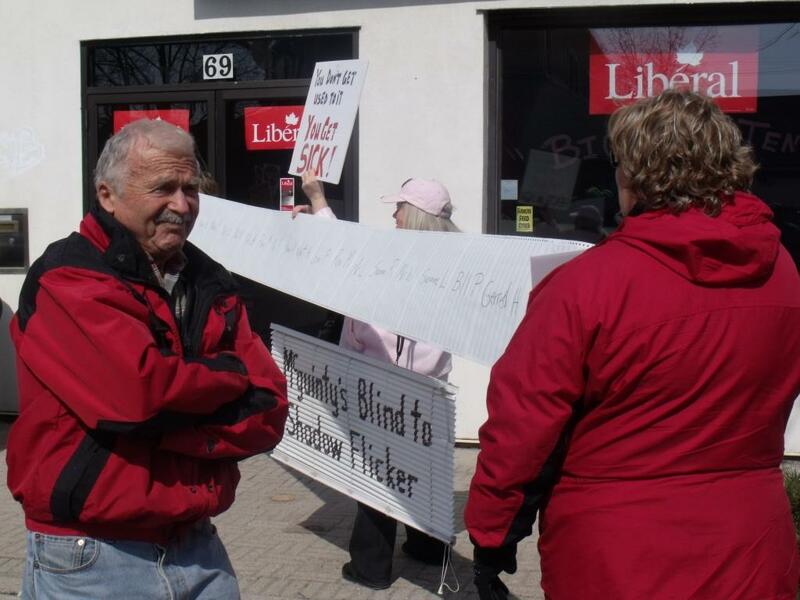 Michaud, who recently spoke to a crowd of over 300 people in Grand Bend, suffers from severe headaches and vertigo – conditions which started after four industrial turbines were set up by Kent Breeze and Suncor near the family’s rural home. Her son, Josh, is also affected. He used to work in construction on roofs but can’t anymore because of the dizziness he experiences. “It’s like there is a constant ringing in my ears,” he says comparing it to coming out of a really loud concert. Michaud says the turbines are also having an impact on the family’s goats, which for unexplained reasons, refuse to go into their shelter at night and don’t sleep. And the animals have had a number of false pregnancies – the first time they’ve had significant problems with their flock. I am not a farmer, nor am I a member of the Ontario Federation of Agriculture (OFA). For some, those two facts will negate any credibility that I have to offer an opinion on the organization. I accept that. However, before jumping to conclusions, let me assure you this editorial is not a public rant about the value of the organization or a call for it to be dismantled. Rather, it focuses only on their activity with respect to industrial wind projects. In that regard, in spite of claims to the contrary, I would submit that the OFA has demonstrated no particular aptitude for protecting the health of rural Ontario. That would specifically apply to their membership, largely comprised of those who have opted to host wind turbines on their property. However, by extension it could also apply to rural Ontarians at large. The predicament that the OFA is in may be attributable to a rather limited understanding of some of the key issues that actually impact the health and well being of those in proximity to turbines. In view of this, they are not blameless for their situation. But, by the same token, they are not entirely at fault. The rules established by the Ontario Government to roll out wind projects are stacked against the OFA. Also, some OFA members adamantly fight to place their property rights over their own health. Let’s consider these one at a time. The primary example often quoted by the OFA as substantiation for how they are protecting health, is their successful lobbying to move turbines from 420 meter setbacks to 550 meters for participating land owners. Although well intended, this move could best be characterized as tinkering. It will do very little to alleviate the potential ill effects of turbines. One only need look at a couple of current examples. At this time there is a Renewable Energy Application in front of the Ministry of the Environment for the McLeans Mountain industrial wind project on Manitoulin Island. This application is for the construction of 24 turbines each with 2.5 megawatts in power output and a maximum sound power level (noise level) of 104 decibels per turbine. As with most projects like this, there is a requirement for a detailed Noise Impact Assessment. 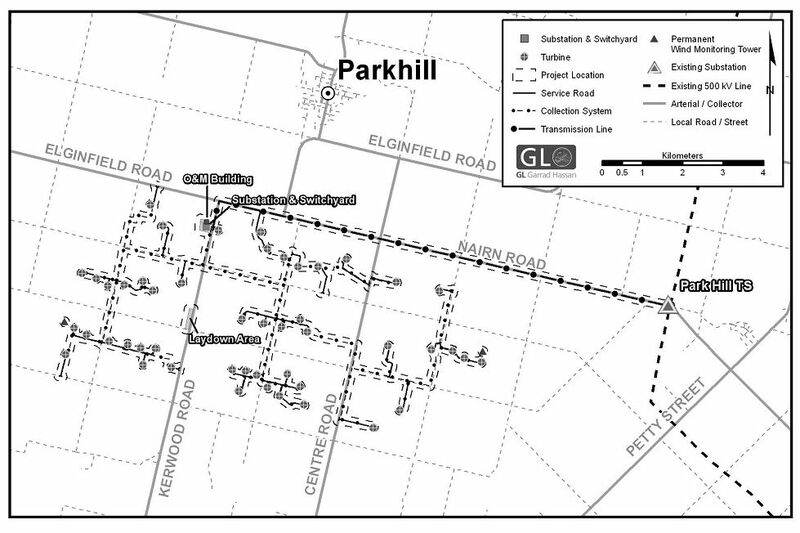 In the Mcleans Mountain noise assessment you will find a map that illustrates four distinct ‘noise envelopes’ drawn around clusters of turbines. The perimeter of each envelope indicates where noise levels are predicted to be 40 decibels. That noise level is the benchmark for compliance for the MOE. That means beyond that boundary, further from the turbines, noise levels are deemed acceptable. In this project that border physically occurs at approximately 650 metres in a 360 degree direction around each turbine cluster. In a similar example, the Watford Wind Farm project recently approved by the MOE has 4 turbines each with 2.5 megawatts of power output but with almost 108 decibels (107.9) as a maximum sound power level (noise level). The 40 decibel boundary for the ‘noise envelope’ in this case occurs about 700 meters in a 360 degree direction around the group of 4 turbines. A new NextEra ad for the Bornish project in the London Free Press today- just like the Adelaide one a month or so ago. Yep, what they are saying is they are moving hundreds of turbines into our townships, and from now on all the residents and other devlopers must ensure that THEY are 550m away from the turbines NextEra has proposed. They have basically stole 550m of land around each proposed turbine – even if it is not on the signed property. People should be screaming about this type of invasion, plain and simple. One of Middlesex County’s most vocal opponents to large wind turbines says if a comprehensive health study was completed on the affects of wind turbines it would mean the end of the wind industry in Ontario. Strathroy-area greenhouse operator Harvey Wrightman has long called on the Ontario government to invoke a moratorium on the construction of wind turbines until a health study can be completed. “We need a health study,” he says. “It’s not a difficult thing to do and I don’t think it’s too much to ask for. Wrightman notes that his daughter, Ester Wrightman, heads up a group known as Middlesex Wind Action Group, a loose coalition of citizens concerned with the proliferation of wind turbines in their community and the potential ill health affects those structures may cause. Harvey Wrightman says and he and his daughter hear from people on an almost daily basis who live near wind farms and who say they’re suffering from maladies such as sleep deprivation, headaches, dizziness, nausea and impairments of cognitive functions. “People know these complaints are real,” Wrightman says. Wrightman suggests that if the government was to complete a health study on wind turbines it would mark the end of the wind energy business in Ontario. Wrightman charges that the both the provincial government and the wind energy industry have been remiss in the release of information on wind generation and have maintained a strategy of denial when it comes to suspected health problems. Because of the technical nature of wind generation the public in general lacks an understanding of the basics that are driving the complaints about the health effects of wind generation, says Wrightman. “The devil in all this is the technical nature of it, which has worked well for the wind energy industry’s strategy of denial and no release of information,” he says. He suggests there are two phenomena related to wind generation, particularly in very large generators, that are causing the problems. Neither is well understood by the public. They are wind shear and amplitude modulation. “These are technical terms but they are fairly simple in nature,” he says. Winds shear is the difference in wind speeds at the blades nearest the ground level compared with wind speeds at the top of the blade. During the day when the sun is heating up the earth, the wind speed at the ground level is about the same as the top of the blade, or at about 100 metres, mostly because the heated air rises to upper levels. Consequently, during the day a large wind generator may emit a swishing sound that is barely audible. But because of the change in temperature at night that changes. At night the winds at the upper levels blow fairly consistently, while at the lower level winds are much more likely to be calm. “That’s the basis of wind shear,” says Wrightman, adding that wind shear is expressed as a co-efficient and is monitored and recorded by Environment Canada as well as by most airports. A wind shear factor of 0.4 is about average on summer evenings. He adds that the blades on a wind turbine are twisted so they’re able to catch the wind to optimize wind power at the upper level. He adds that when the blade passes the tower, the change in air pressure causes a pulsing that can be heard faintly in daylight hours at one to three decibels. But at night, when the upper pressures are considerably higher — in other words, under wind shear conditions — the pulsing will be in the range of five to 15 decibels. “At that point it becomes a thump rather than a swish,” Wrightman says, adding that the sound also carries further under wind shear conditions. 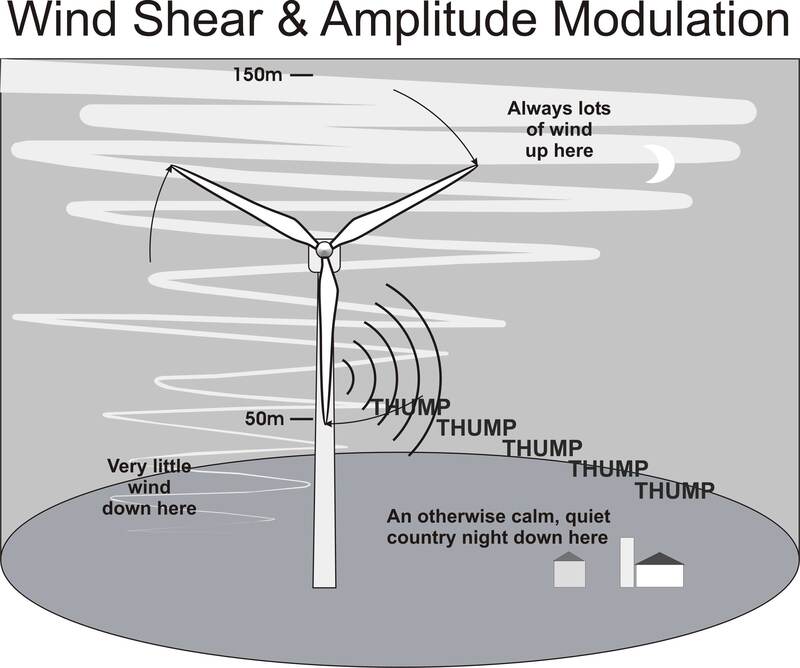 Meanwhile, amplitude modulation refers to the increase in the aerodynamic noise coming from wind turbine blades, and while it’s not well understood, researchers have suggested its severity could be dependent on operating conditions, weather, or even the location of the listener in relation to the turbines and the wind. Wrightman says there’s no “technical fix” for the wind shear problem and suggests that the only solution is a mandated minimum distance set back for wind turbines of at least 2,000 metres, as opposed to the present requirement of 550 metres. “They can go ahead and build them, that’s fine, but give me that setback,” says Wrightman, adding that admittedly under those conditions there would be few turbines built within the province. He says the McGuinty government has steadfastly refused to acknowledge the effects of wind shear and has continued to force his green energy plan on the rural communities of Ontario. Wind power generates noise at levels that Ontario says must meet enforceable standards — but it has no enforceable standards. 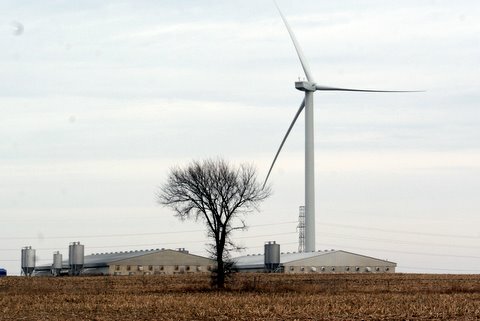 The long shabby story of wind noise from the province’s wind energy regime: Misguided Direction or Failure to Communicate? The issue of noise from Ontario’s wind farms deserves a full public review. Instead, people are getting a run around from bureaucrats and politicians. Standards don’t exist, yet approvals are being issued without regard to consequences or the impact on people of noise levels. Donna Cansfield, in November 2005, as Ontario Minister of Energy issued a “Direction” to the Ontario Power Authority instructing it to enter into contracts for up to 1000 MW of new electricity supply from renewable energy. Most were wind turbines. The health and other effects of wind turbines wasn’t actively studied before the contracts were signed. Noise, building codes, environmental standards etc. existed and were adapted to fit. No real review was undertaken. So the “noise” information used for Amaranth in the Environmental Screening Report in 2005 to secure the licence from the Environment Ministry was done without a “recognized standard”. Glen’s home and farm in Ripley was surrounded by 38 industrial wind turbines. This movie was taken 2 years ago in 2009, when Glen had already been forced to buy a townhouse in Kincardine to live in, only to return to the farm to care for his cattle ~550 head of cattle. In the spring of 2011 the Ripley Wind owners Acciona and Suncor, bought out four homes that were negatively affected by their machines. But the wind companies deny any health issues, stating “No link between the operation of our Ripley Wind Power Project and the health concerns of our neighbours could be discovered, and so no damages were awarded or necessary.” After watching this movie — you decide whether they should have a guilty conscious. Does this buy-out demonstrate a “commitment to work with residents and the community” as the company suggests? Shame on our provincial government for allowing this kind of human displacement to happen in our rural townships. In the middle of 38 industrial wind turbine development sits Sandy’s former home. This movie was taken 2 years ago in 2009 and the pain and suffering she is feeling at the time is palpable. In the spring of 2011 the Ripley Wind owners, Acciona and Suncor, bought out four homes that were affected by these machines. But the wind companies deny any health issues, stating “No link between the operation of our Ripley Wind Power Project and the health concerns of our neighbours could be discovered, and so no damages were awarded or necessary.” After watching this movie — you decide whether they should have a guilty conscious. Does this buy-out demonstrate a “commitment to work with residents and the community” as the company suggests? Shame on our provincial government for allowing this kind of human displacement to happen in our rural townships. As Sandy says, it’s not only her health that was affected – her family and community unit was ripped apart as well — by some out-of-town company and politicians in Toronto who never had to learn or experience the trauma these machines caused. Is noise the most neglected green issue of our age? This book argues compellingly that it is, and tells you all you need to know about noise as a social,cultural, environmental and health issue. Across the world, more people are disturbed by noise in their day-today livesthan by any other pollutant on Earth. From the shanty towns of Mumbai to thesmart boulevards of Paris,noise is a problem. It is damaging people’s health, costing billions, andthreatening the world’s natural sound systems in the same way thatclimate change is altering its eco-systems. Drawing on evidence from all over the world, this book showcases policies andstrategies that have worked to decrease noise pollution, and offers lessons forpolicymakers and environmental health professionals, campaigners and anyindividual affected by noise. Written by a renowned noise campaigner and experts in law and health, this booktells you all you need to know about noise as a social, cultural andenvironmental issue and how we can act to build a more peaceful world. A meeting of more than 100 people gathered at Bosanquet school last week to hear why they should not sign contracts for proposed windfarms. On a ‘truth about turbines tour,’ John Laforet, president of Wind Concerns Ontario told the group this is an election year and these people have to let their elected official or local candidate know how they feel about the proposed wind farms. Laforet says while wind turbine companies have no problems selling residents on the benefits of wind-generated electricity, they fail to mention the negative aspects. President of Wind Concerns Ontario, John Laforet, was one of the guest speakers at last night’s Lambton Shores Concerned Citizens Group community meeting, and noted that frequently wind generated electricity is wasted. Four speakers, including Laforet explained the health, economic, ecological and environmental dangers of the wind turbines. First up was David Colling. He is a Ripley retired dairy farmer who has is an expert in electrical pollution. He gave examples of five home owners became increasingly ill once the turbines were installed and have since sold their homes to wind farm companies. He said he is not permitted by litigation to state names or addresses or use photos of those displaced people through gag orders. He did have photos of their homes, which he snapped from the road. He has been helping people for the past six years in relation to stray voltage and health issues. “Farmers have to analyze what they are signing,” he told the gallery. He said they are not getting the proper advice and he has not seen a contract yet that is good. 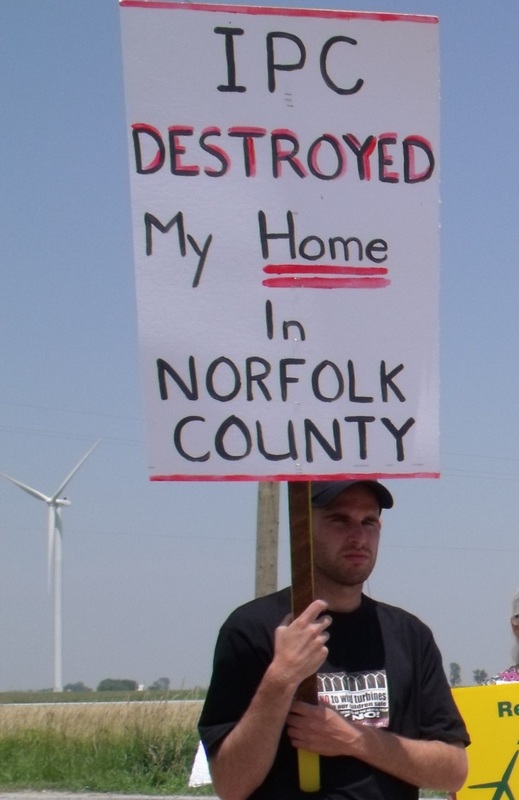 Those displaced or living the effects of the windfarms, Colling says he is told their lives have changed forever. “It might take awhile before it effects you-but it will.” He said for “these people” meaning the wind companies,” it is all about the money.” He warned those in attendance to go to a corporate lawyer before they sign anything. “You would not go to a dentist for heart surgery,” he said in his warning. Stepahana Johnston from Port Rowan says she comes to these meetings to escape her own home. She says she built it for her aging years and since the 18 industrial turbines went up three kilometers from her home. She is a University of Toronto graduate of physical health education. She used the analogy that not everyone gets sick when they are on the water, but she does and not everyone feels the effects of wind turbines, but she does. She said she speaks to group like the one at Bosanquet school -“because they need to know.” She said she has reported her ill effects to the Ministry of Environment without response. She said she called these Ministry two or three times a day. When that did not work she wrote letters. She explained she received a response that they did not have the instruments to help her. Out of frustration she now goes to speaking engagements like last week’s. David Libby lives in the once quiet area near Ridgetown, Ontario. 50 wind turbines have since started up, and the noise from these machines is now affecting his health. No form of government will help him, nor protect him. This is the very real, and upsetting reality that is hitting rural Ontario residents over and over again, with politicians turning a blind eye so that they can continue their very destructive energy program. My name is Lyric Allin, I am 13 years old, and I am very much involved in the protesting of wind turbines. I have been involved for about 3 years now and I think that the turbines do not give the whole truth about what they are doing and why they are doing it. I started to be involved when they set up the proposal for the Bornish land to be developed and industrialised into a wind farm, I still try to stay involved so that way no one has to face suffering in their own homes because they unknowingly agreed to putting a wind turbine in there backyard. But in some cases, this is not the case; some people have unfortunately just happened to have someone put one up close by. Now I understand that everyone has there own opinion about things that fall in their jurisdiction, but what gets me is that they have never done any studies of any kind to make sure that a wind turbine is safe to be placed in some ones yard. Now when I first found out about green energy I was really exited about it I thought that all our problems where going to be solved and that this would help the world stay healthy, but when my family looked closer we found out there where a few flaws in this for starters Flicker, birds and other animals being killed, the sound waves that they give off, people being pushed out of there homes and signing gag notices, and the disruption of the water table. Now all of this is very important to my family and me and we don’t want to have it happen in this area. So we took action trying to put a stop to the wind turbines and we found out about some pretty upsetting stories. For example, did you know that flicker from the trees and from the wind turbines movement can be a distraction for drivers and that at the center of the turbine is going 6 km per hour but the tips can be going about 50-60 km per hour. Now imagine driving along the road and seeing something like that, it would be very distracting for you would it not? But some people have to live with this all the time every day well unless they move or sell there houses to the company, but when and if this happens you might have to sign a gag order making it so you can’t talk about your experience. 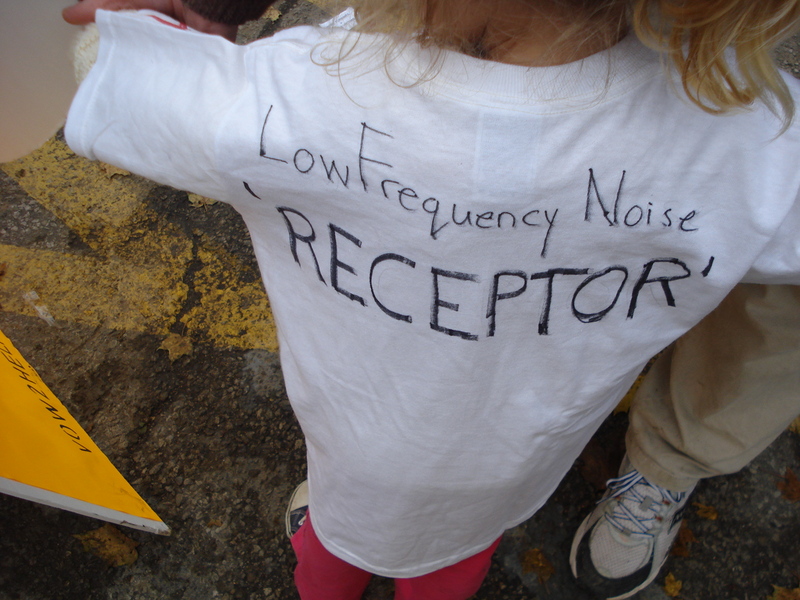 But that’s not all the sound waves from the wind turbines make people and animals sick, we have learnt about a 5 year old boy that one day said to his mom that it felt like his legs where bleeding and if you have had any children you will know this is not something that a 5 year old boy will say. That lady made a blog to talk about her family’s problems it is, http://www.mywinddiary.blogspot.com/ if you want to read about their problems. But when someone brings this up they say, “Oh well they are just not use to the sounds coming from the wind turbines, they live in the country and are used to total silence.” But how do people explain whole herds of cattle that have to be put down because they look like they have rabies, well could that be stray voltage disturbing the cattle and other farm animals. 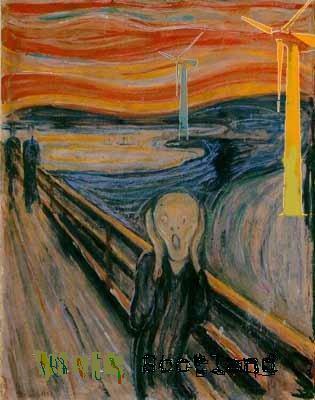 But the really sad thing is that birds and bats are flying around and hit the turbine in mid spin. Why do they do this? Well, it could be because a bird has a flight pattern that they follow so when a building is put up when they are gone then they will run into it because they are just following the patterns that they have there whole life. Lastly I would like to talk about how when they put up a wind turbine that they have to put a concrete slab down into the ground and when they do this it is not just going to go away, no for every action there is a reaction and in this case we have to take in consideration of the water table. So stand up and involve yourself so that we can have health studies before wind turbines and to have safe setbacks to keep all the families safe that live near or around wind turbines. The way the wind energy program has been imposed on rural Ontario is more than a shame – it is an abuse. Clearly she is having a problem with intrusive noise that is causing sleep disturbance, and the obvious source of the disturbance is the wind turbine noise. After 10 PM there would be little else in a quiet, rural community to cause someone to be suddenly awakened. Her experience is not singular, rather it is the very essence of most complaints about wind turbine noise – sleep disturbance. Repeat this experience over many nights and other more serious health problems will develop. Sleep disturbance is a well-known cause of serious health effects, and acknowledged by the medical community. Why is this happening? One would expect as the ground wind dies in the evening, the turbines would cease turning and there should be no noise. There is another feature of wind turbines that is obvious, but overlooked. They are not “ground sources” of noise like a highway or an industrial plant. They are “aerial sources” more like a helicopter albeit one that remains in one place. At the height that wind turbines reach , 80m – 130m , wind conditions are quite different than they are at ground level. Laura Wilde who lives on West Ipperwash Road in Kettle Point has been a resident of the area nearly her whole life. She loves the area is close to her siblings and children, all of whom live within a short distance from her house. Another area resident “Gerry”, (his name was changed), bought a 72 acre farm just off of Proof Line in Lambton Shores with his wife and son in 2000; a place he and his wife hoped would be their retirement home years down the road. Unfortunately these perfect strangers who live within the vicinity of the six wind turbines in Ravenswood and four Turbines in Lambton Shores, have one thing in common. They are deeply concerned about health effects caused by wind turbines. Wilde said her skepticism about turbines started before they were even built in her area. Shadow flicker from the turbines in the morning reflects through their windows and into their homes. Wilde said it’s so bad she can’t be in the room when the flickering is happening. Her son who has two-year-old twins, is also concerned about whether or not this will have a negative impact on the twins. And that is not all. Wilde said some nights she is unable to sleep because of the noise coming from the turbines. While some nights are worse then others, she has a tall dresser leaning against the south-facing window in her bedroom to help muffle the noise. On worse nights she will throw a few pillows in between. The noise from the turbines is bothersome for Gerry as well. With one turbine less than one-kilometer away from his home and others just over that distance nearby, he said he hasn’t had a good nights sleep since the turbines started turning. Gerry said the humming in his ears keeps him awake most of the night and is so exhausted at times cannot function throughout the day. Fed up with feeling this way, he has decided to put his house on the market and hopes he can sell his home and forget all this has happened. and the Township of Brooke Alvinston to name a few. Mr. Evans asked where the head office is located and was told it is in Burlington. Mr. Evans stated that since there isn’t enough information available, it could be considered an insult to ratepayers. Present: Mayor David Bolton, Deputy Mayor Adrian deBruyn, Councillor Betty Ann MacKinnon, Councillor Kurtis Smith and Councillor Nick Stokman. Also Present: Administrator/Clerk/Treasurer Fran Urbshott, Road Superintendent Eldon Bryant, Chief Building Official Jeff Denomy, Fire Chief Arend Noordhof and Drainage Superintendent Hank Hoeksema for part of the meeting. Resolved that Council become the Committee of Adjustment for Consent Application #ZBA05/2010, submitted by David & Terry Brand. CARRIED. Councillor MacKinnon left the meeting. Of the Applications: The purpose of the application is to sever the land that is proposed by the Bornish Wind Power project for an electrical substation from the remaining agricultural land. The subject land is currently designated “Agricultural Areas” in the Township Official Plan. The Zoning By-law of the Township of Adelaide Metcalfe 34-2007 zones the subject land as General Agriculture (A) zone. 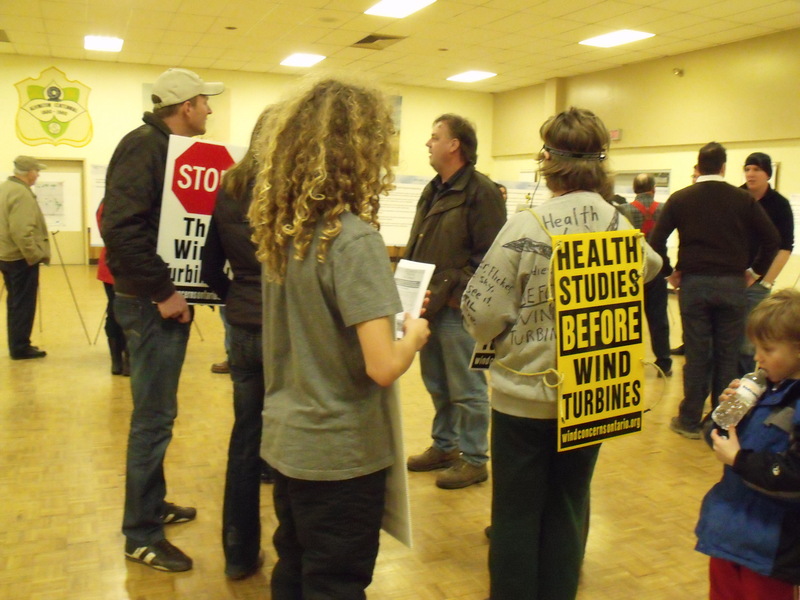 Last night we attended the second and final Brooke-Alvinston Wind Project “Public Consultation”. Incredibly frustrating- so much so that I just stopped asking questions. There were NO print copies of the project report! Lots of Canwea junk but no project info. Mr.Cobb, president of Green Breeze Energy, stated, “…they wanted to save trees.” No kidding. So the public isn’t even obliged to view the report that will erect 4 2.5MW turbines South of Watford, because this company is trying to live up to its phony name, or maybe they’re broke. This is more than frustrating because you couldn’t even discuss the draft (the whole point of the meeting) without it present…something like not bringing the birthday boy to his birthday party. We were told many times to go home and ‘view it online’, which in my opinion just shows their contempt for the public. I mean really, why did they even bother to come? Apparently they didn’t have to do any bird or bat studies because “no bird or bats live in the project area” (the project area consists of small circles around each turbine). Never mind any wildlife passing through. Only after a promise was made by project manager John Cobb at the first meeting and many e-mails to the company were we able to get rush printed copies of the noise and shadow flicker maps tacked on to a scribble board. What happened to the ’60 days to review’ period? People living in the vicinity had never seen these maps before- how were they supposed to comment on something so important in one night? There were no noise representatives there. And the only person who we were directed to was a well known Stantec jerk that nobody wanted to talk to again. He is the ultimate loser for community consultation- he’s there to tell you ‘no you can’t have anything you need.’ I give the project coordinator Cobb some points for at least not treating us like scum and attempting to get us info (…60 days late). Eventually a dozen or so of us just went outside and grabbed our signs to protest and went in and annoyed the windies. 12 year old Lyric, aka “Shadow Flicker Queen”, did her job well making sure each and every proponent had their taste of flashing light in their face. A bit of justice. Construction could begin this summer on a four-turbine wind farm planned for Brooke-Alvinston Township. Mississauga-based Green Breeze Energy Inc. held its second public meeting required to secure provincial approvals for the 10-MW project Thursday at the Brooke-Alvinston-Inwood Community Centre. It already has a contract to sell energy to the province. Township Mayor Don McGugan estimated about 75 people were at the meeting, including some wind energy opponents. “They had a chance to voice their opinions, which is good,” McGugan said. The wind farm is planned for a site bounded by Old Walnut and Ebenezer roads, just south of Churchill Line. 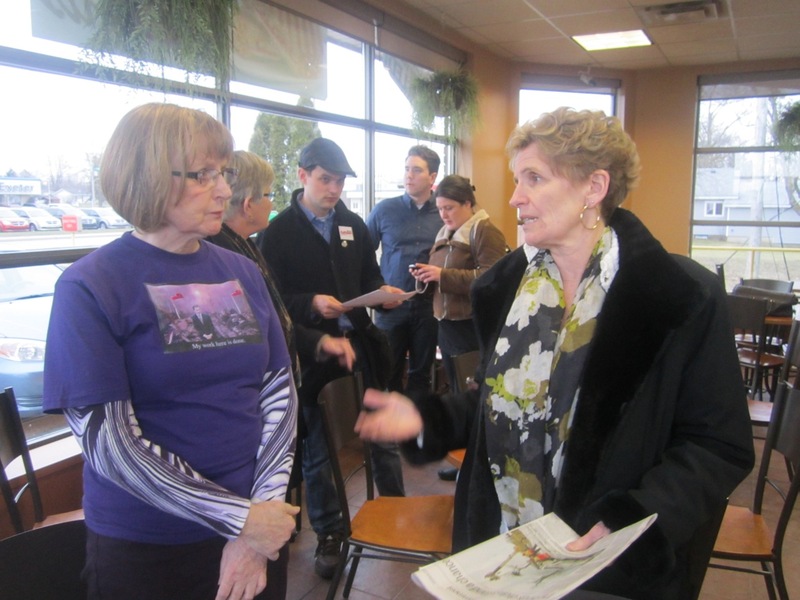 Esther Wrightman said she was among 12 to 15 wind opponents at the public meeting. She lives in neighbouring Middlesex County, about 15 minutes away from the turbine site, but said her father’s family is from Alvinston. Wrightman said she has been to several wind project open houses around the region in recent years and came away from Thursday’s feeling her questions weren’t being answered. “They just get worse and worse and worse, because it seems they don’t have to provide as much information any more, either that or they’re just not,” she said. I make no claim of impartiality. I am an advocate for protection of the health of the rural population where wind turbines are to be deployed. On my way to Chatham, I drive through 5 wind projects (proposed and under construction) besides our own. I cannot see how one could remain unpolarized. I also know there are very few supporters in the rural areas anymore – just the very few with direct, large benefit. The Kent Breeze project is the template – one property owner gets all the rent. Everyone else there isn’t even a good-bye, or go to hell. The most notable problem for the Suncor and AG lawyers is their lack of technical background, and so they depend on the support staff to provide them with content. It easily leads to confusion for the lawyer. Most of us would be similarly affected. But, sitting in the gallery it is delightful to watch – after all, they are making more money than most residents. Let them earn it. Wednesday morning was taken up with Ms. Frederika Rotter , affectionately known as “Freddy”, questioning Dr. Christoper Hanning, a sleep disorder specialist from the UK, via teleconference. Fortunately, he must not be from Northumbria, as I could actually understand him even with “speaker phone” connection. New York Environmental Psychologist Dr. Arline Bronzaft is not afraid of attorneys- they don’t faze her one bit. Dr. Bronzaft is a firecracker that says everything in plain English and is ready for any question thrown her way. So when the Andrea Huckins, lawyer for the Ministry of Environment and Albert Engel, lawyer for Suncor, started into their same old rigmarole of trying to remove the expert from the hearing, she was ready with her extensive list of qualifications that would make most of us feel small and wonder how somebody could accomplish so much in life. Well, it helps if you start early like Dr. Bronzaft and begin teaching college at age 19! Is it beating or swishing? The good people at the MOE love to engage in titillating word-play for fun and amusement. Last summer I had the audacity to actually write the Minister of Energy and the Minister of Environment and put it to them that the MOE was not properly dealing with the “cyclic noise” of wind turbines – you know, the swooshing, swishing, whumping sounds that many residents complain about, especially when it occurs at night and they cannot sleep. If you have a dripping tap, you fix it. But you can’t turn off the wind turbine; and no one else will, certainly not the man in a control room located somewhere in California. Now there are regulations for just this sort of thing. In Ontario it is Reg. NPC-104 which states that any industrial machine that produces a “cyclic” noise, one that repeats over and over as long as the machine operates, for example, a punch press in a metal stamping plant, is subject to a 5dB penalty to its noise limits. I attended the Green Breeze Energy public information meeting for the Brooke- Alvinston Wind Farm. Of the half-dozen or so wind proponent meetings I have been to, I would have to say that this was the worst meeting for actual information available. On Monday September 20th, the large turnout of 80+ residents to the Adelaide-Metcalfe council chambers certainly influenced the decision of council to defer voting on the land severance application for NextEra. Note that it can be submitted again, or it will be put forward in another form or another property. Dr. Robert McMurtry MD FRCSC FACS speaks to a large gathering in Clinton, Ontario about the health issues that are arising in Ontario homes that are close to wind turbine developments. He stresses that a full independent epidemiological study is needed before these developments are installed, but unfortunately the Ontario government is trying not to listen, and people continue to become ill. The only recourse left is to take the provincial government to court: Support the Ian Hanna Lawsuit.